On Saturday I woke up around 9:30 and had some breakfast before leaving at 10:45. I parked at the Greenbelt stop and boarded the train at 11:20. We sat there for almost 10 minutes and then finally departed. 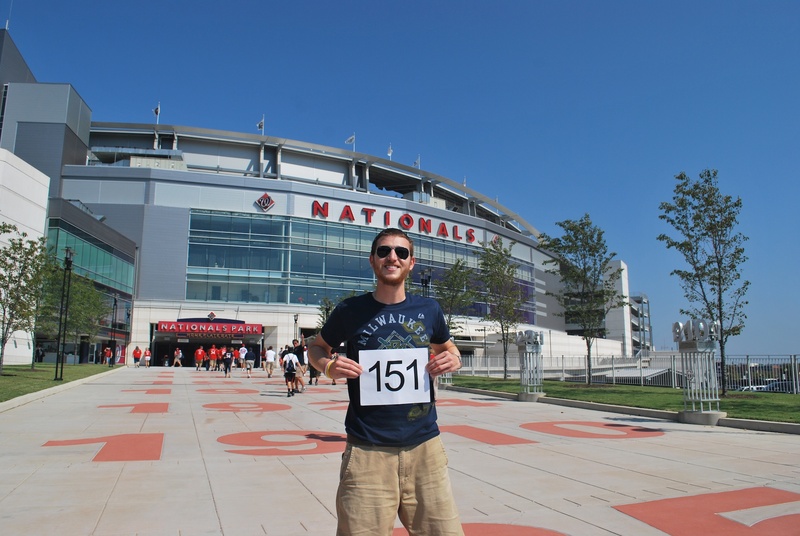 Once I got off the train at the Navy Yard – Ballpark stop I walked towards the centerfield gate and had a nearby lady (Kim) take game photo number 151. 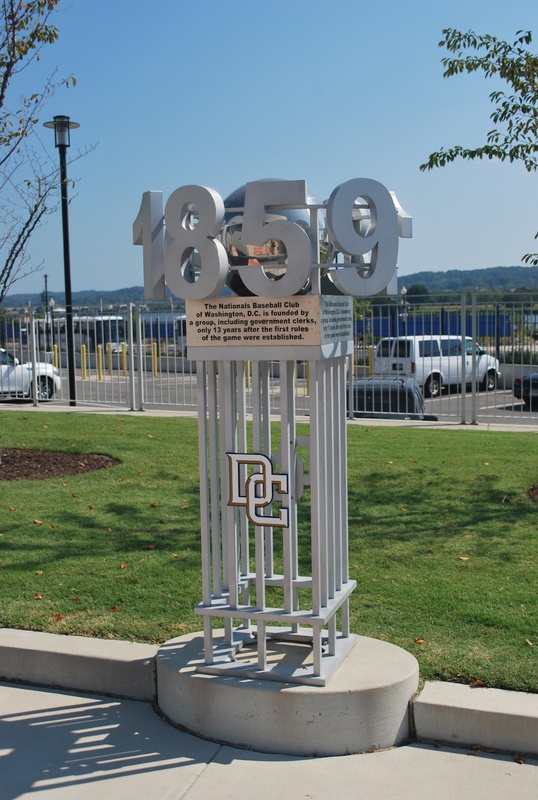 I normally try to get the exterior ballpark picture from behind home plate, but someone I asked on Friday said that there really wasn’t good exterior signage by the home plate entrance. I told Kim my story and thanked her for helping me out. I then went to the player will call window near home plate to get my ticket. Since I was there I figured I should at least look if they have anything on the exterior. I think this would classify as exterior signage. 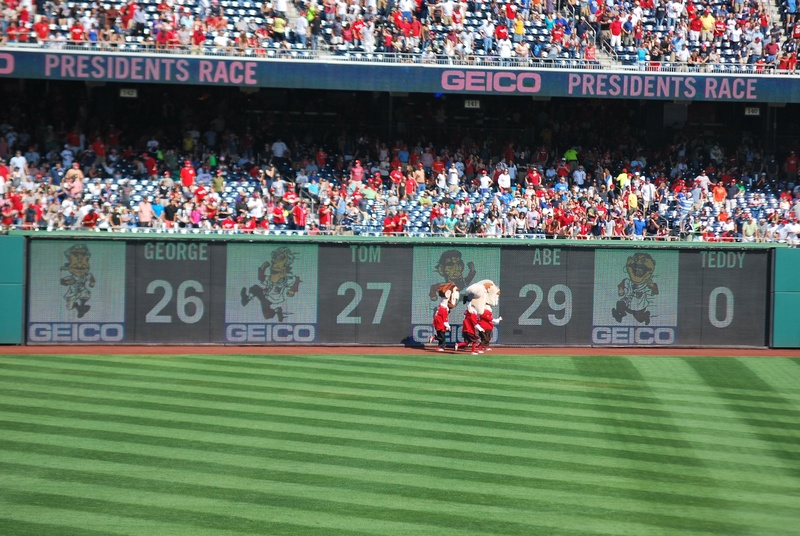 Those numbers on the ground represent the years that important events took place in Washington baseball history. On the right you can see those metal structures. Here is a close up of one of them. I entered the ballpark at 12:40 which was pretty late for me given the 1:05 first pitch. I got a hot dog and a designated driver beverage (lemonade) and then went to my seat. I was in the same section and row as Friday, but 11 seats farther from home plate. 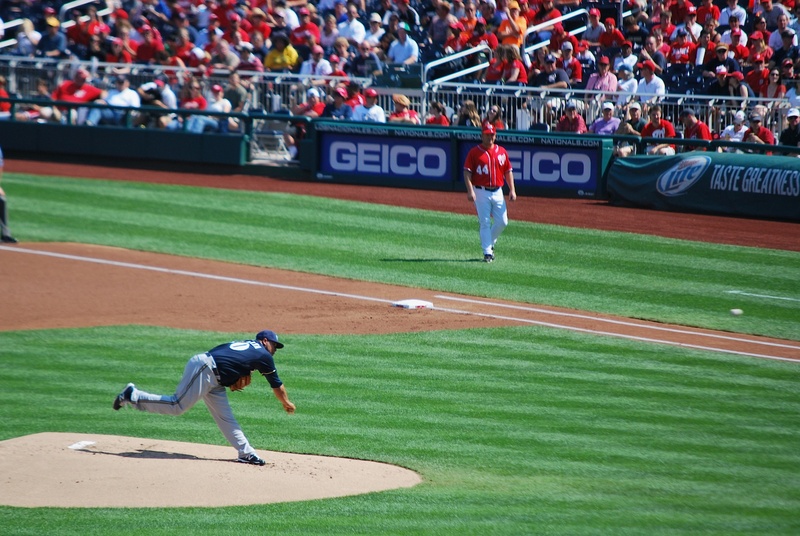 Gio Gonzalez threw a called strike to Aoki to get the game underway. The Nationals got to Peralta in the 3rd, scoring three runs on 4 hits, including 3 doubles. After walking a batter to load the bases with two outs Roenicke made the call to the bullpen. Unfortunately Sunday’s performance was not duplicated. On Sunday he threw 104 pitches to get 24 outs (4.33 pitches per out). On Saturday he threw 73 pitches to get 8 outs (9.13 pitches per out). He walked four which is always going to escalate the pitch count. Hopefully it’s just part of the learning process (he’s only 23) and he can bounce back. Livan Hernandez had entered for Peralta and got out of the bases loaded jam in the 3rd without allowing another run to score. The 4th inning, however, did not go as smoothly. The first seven at bats of the 4th went like this: groundout, single, walk, 3-run home run, single, single, (coaching visit to the mound), 3-run home run. Eeeeeeesh. 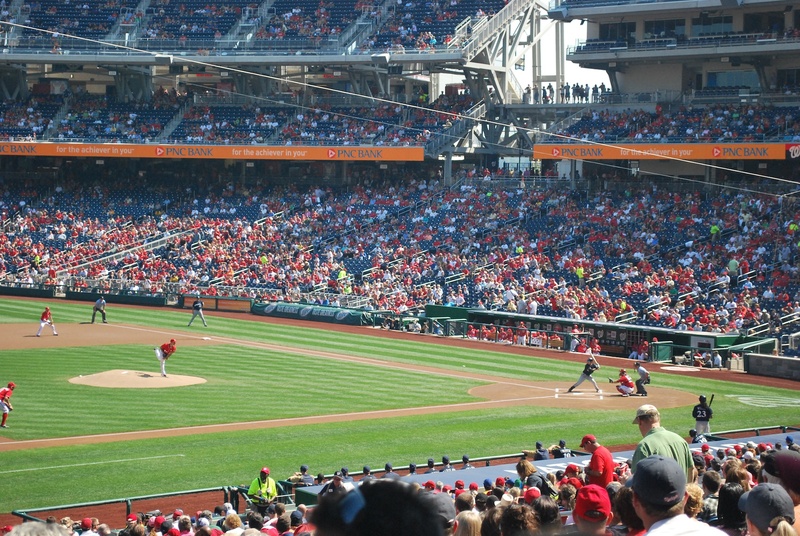 The Nationals increased their lead to 9-0 in a span of a few minutes. The Brewers got on the board in the 6th with an RBI groundout from Braun and a sacrifice fly from Ramirez. A home run from LaRoche made it 10-2 Nationals after six. 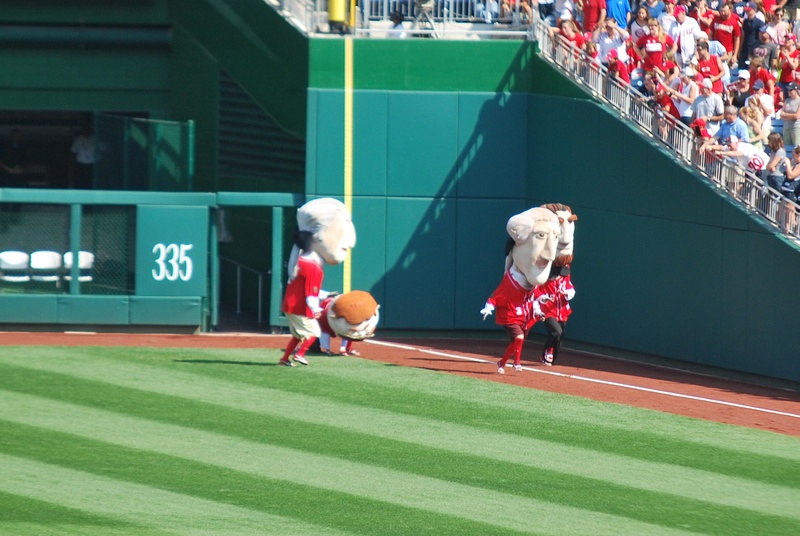 In the top of the seventh there was a scary moment if you were a Nationals fan. 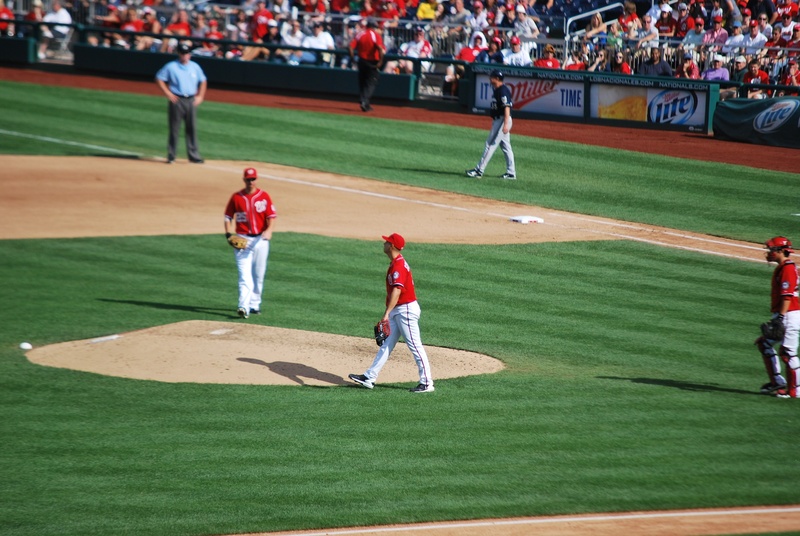 Gio Gonzalez, who is the Nationals’ best pitcher (perhaps even if Strasburg hadn’t been shut down) stumbled while letting go of a pitch to Maldonado. He laid face down on the ground for 2 or 3 seconds before finally getting up. I tried getting my camera out to take a picture of him just lying there but I wasn’t quick enough. This is after he got up and everyone came over to see what happened. I saw something similar in the highlights of a different game recently and the pitcher did something to his oblique muscle so I wasn’t sure if Gio was actually hurt. It wound up being a scare and all the fans gave him a standing ovation (I think he was just plain embarrassed). He pitched great on Saturday though, so there wasn’t much to be embarrassed about. 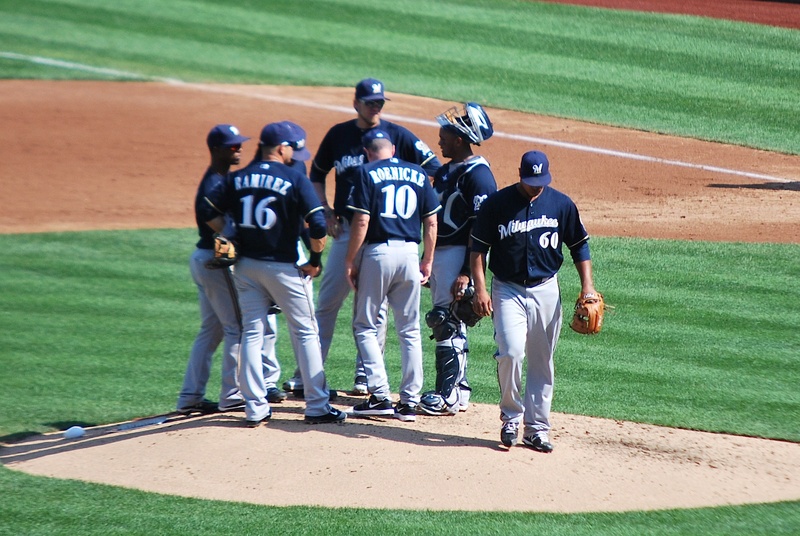 Roenicke started putting in the September call ups towards the end of the game to give them some playing time. With all of the games being close as of late, and the Brewers being right in the wild card race he hasn’t had the opportunity. Taylor Green hit a 2-run home run in the 9th but that’s all the offense could muster. Final score: Nationals 10 – Brewers 4. A close loss (I think) is harder to swallow because you can say “what if” about a lot of stuff. A blowout is easier to forget. It’s baseball: it happens. Unfortunately the Cubs blew a save in the 9th inning and the Cardinals wound up winning 5-4 in 10 innings. The Cardinals now have a 2.5 game lead in the second wild card standings. Right back at it tomorrow with a 1:35 PM first pitch. Gallardo is “toeing the slab” (baseball slang for pitching) and I’m hoping he can keep doing what he’s doing (pitching really well). I missed 3, yes THREE pitches at the game on Saturday. Looks like it wasn’t just the Brewers who had a bad game. 1) I missed the fourth pitch to Maldonado in the 5th. I was looking at the out of town scoreboard and was telling the guy next to me that the Cubs had the bases loaded. 2) I missed the first pitch of the bottom of the 7th. I found a half full bag of peanuts under the chair next to mine (it wasn’t anybody’s around me) so I started eating them. 3) The first pitch to Taylor Green in the 9th. I was looking at my phone trying to get an update on the Cubs game. One last thing, there are two home games left that my extra seat is available for; Friday, September 28th and Sunday, September 30th. I ask $40 for the ticket (face value) and you’d be sitting with me for the game. The money goes to the Be The Match Foundation. Also, I have other tickets for Monday, October 1st, so BOTH of my tickets are available for that game. You and a friend wouldn’t be sitting with me but the $80 for the two tickets would go to Be The Match. My season tickets are in section 221, row 6. Leave a comment if you’re interested. I’ll take those Oct. 1st tickets off your hands if they aren’t gone yet. By the way, you’re doing a great thing!! I may very well be interested in joining you for friday and sundays game.